The desire to be right is something that was taught to us at a very young age. When we get the answers right in school, we get better grades. We went out into competitive working environments and those that received the promotions seemed to be those that make the right choices and had the fewest failures. This is how we came to believe that being right was the goal. We’re Not Listening. When our desire is to be right, we’re not listening to our partners. We may be dominating the conversation, talking over our partners and not fostering an environment for healthy dialogue with the one we promised to love and cherish. We may be interrupting our partners or not actively listening because we’re thinking about the next rebuttal that will align with our beliefs and ideologies that will make us, at least in our own minds, right. We Learn Nothing New. There’s a quote by Pema Chödrön that says, “The truth you believe and cling to makes you unavailable to hear anything new.” When we’re so tied to our own views and opinions, we don’t allow ourselves the opportunity to learn anything new. If we don’t think our spouses have valid, interesting ideas and insights, then why did we choose them as our partners? It’s been my experience that there is nothing and no one that can teach us more – mostly about ourselves – than our spouses. Our role is to remain open to the lesson. We Remain Stuck in the Past. When we’re not learning anything new, the only insights from which we have to draw upon for making decisions is the past: our past experiences, our past failures, our past relationships (that obviously didn’t work). And when we’re focused on the past, we unintentionally perpetuate those same experiences, bringing them into the present and allowing them to impact the future. This is how we repeat the same relationship mistakes over and over again and experience repeated heartache, even inside the same relationship. What’s the Definition of Right? Every one of us has a lens through which we see and experience the world around us. Embedded in that lens are decades of thoughts, beliefs, judgements, experiences and opinions. No two people on the planet have the exact same lens because no two people have had the exact same life experiences that led them to the exact same conclusions. So, although our own opinions seem painfully, obviously accurate and correct to us, it’s unlikely that someone else – even your life partner – will see all the important parts of the relationship the exact same way. Maybe there is no real definition of right; maybe we each just have an opinion. There is No Hierarchy in a Healthy Relationship. If we behave as though our beloved’s opinion isn’t valuable, it can create an unintentional hierarchy within the relationship where one partner feels better than or smarter than the other. The best relationships are comprised of equals with mutual respect for one another, which cannot occur when we’re not willing to listen to and consider one another’s opinions to be just as valid as our own. It Limits Our Ability to Connect. 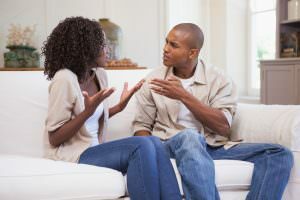 Prioritizing the need to be right in an important conversation with our spouses will limit our ability to connect with him or her. Through my coaching practice, the one thing I hear more than any other thing that’s missing inside of a struggling marriage is connection. But when we have to be right, then the other person is automatically wrong. And when we feel like we’re consistently being made to feel like we’re wrong, that’s not someone we’re anxious to curl up next to at night. When there is a consistent need to feel right – particularly with the one we chose to spend our lives with – we’re falling back into habitual behavior that may have served us in other ways. Instead, we need to become intentional about employing different strategies in our most intimate relationships so that both people feel safe, valued, heard, important and equal.